Ever since Mencken, the Puritans have had a terrible reputation. They deserve a better legacy, and it’s time we rediscovered it. When the Iron Curtain collapsed 25 years ago, leaving what seemed a world without walls, many Very Serious People heralded neoliberal capitalist democracy’s triumph on earth. “One thing the Cold War did accomplish,” wrote the Cold War historian John Lewis Gaddis, “was to vindicate democracy and capitalism.” Thomas Friedman gazed at multinational corporate logos on buildings and baseball caps in Bangalore and announced that The World Is Flat, reflecting a belief that cosmopolitanism and liberal democracy would inevitably follow open markets. The Harvard economists Jeffrey Sachs and Andrei Shleifer coached Russia’s fitful movements in that direction. The European Union contemplated admitting 60 million Turks, pending economic and political reforms. If this newly flat world had a summit, it was Davos, and when September 11 revealed that it also had an abyss or two, an American President from an old, Puritan lineage led a “coalition of the willing” on a mission to carry democracy and capitalism to millions presumed eager to embrace it in Afghanistan and Iraq. But even as many societies embraced variants of a neoliberal economy, their ruling elites had to reconcile its benefits with its social disruptions, which often aroused not liberal-democratic enthusiasms but religious and tribal resentments—Jihad vs. McWorld, as the title of Benjamin Barber’s 1995 book put it. Rulers eager to escape that conflict have tried to revive national religious and mythic traditions to sanctify modernization and reconcile it with their own power. India’s Hindu-nationalist Bharatiya Janata Party has displaced the Congress Party, the long-dominant carrier of the vaguely social-democratic legacies of Mahatma Gandhi and Jawaharlal Nehru. China’s Xi Jinping is reinforcing an oxymoronic communist state capitalism with appeals to ancient Confucian understandings of the state as an organic, familial structure, with himself at its head. Vladimir Putin is stoking Russian-Orthodox and Slavic resentments against what he casts as a decadent but imperious Western liberalism. Turkish President Recep Tayyip Erdogan is brandishing trappings of Ottoman imperial glory and sending a frisson or two of that glory from the gates of Vienna (besieged by the Ottomans in 1683) to Brussels today. In Iraq, where only 12 years ago young Republicans were reconstituting the Iraq Stock Exchange, and in Afghanistan, tribalism and fanaticism have buried liberal democracy. Neoliberalism’s quarter-century seems to be stagnating even in America, amid deepening inequalities, school and police shootings, mass incarceration, tech-driven tsunamis of empty information, dangerous climate change, chillingly intrusive surveillance, degrading marketing, and our own tribal and sectarian reactions. The reason is that even if open markets brought liberal democracy, omnivorous, distorted markets are capturing and corrupting it, turning the United States into an un-developing country, ruining its democratic habits and institutions and, with them, Americans’ well-being and morale. That in turn has prompted panicky, shortsighted reactions from Tea Partiers and some religious activists, not to mention from “lone rangers” of all sorts—rogue cops, school shooters, “militia” warriors in the hills. Can those of us who have felt helpless before such reactions do better? I want to show here that as other societies around the world are tapping their ancient wellsprings for antidotes to neoliberalism’s supposedly flat world, we Americans can learn a lot about ourselves and our society by revisiting—but not by reverting to—our republic’s distinctive Puritan origins, which anticipated our present dilemmas and strengths far more acutely than we acknowledge. Unlike Russian Orthodoxy, Confucianism, or the Ottoman Caliphate, Puritan premises and practices gestated and channeled some of the liberal-capitalist premises, practices, and paradoxes that are now embraced and reviled the world over. I want to sketch what those were and how they shaped much of the American republic and, arguably, sustained it through the New Deal and through the civil rights, anti-Vietnam War, and Watergate confrontations. Puritan conceits and hypocrisies certainly seeded some of these messes, but Puritan principles and virtues clarified and rescued the republic from the very worst of them, as they had done in the Civil War. The Puritans were America’s first Very Serious People. Having decided that the Church of England was betraying the Protestant Reformation and falling back into popish, Roman Catholic ways, they fled official persecution to found biblically grounded communities “for the exercise of the Protestant religion, according to the light of their consciences, in the desarts of America,” as one of them, Cotton Mather, wrote later. The first band of about a hundred “Pilgrim” separatists fled Yorkshire to Holland in 1608 and then to Plymouth, Massachusetts, in 1620, on the Mayflower. In 1630, led by John Winthrop, a well-financed, somewhat less separatist group of about 1,000 people founded Boston, their “city upon a hill,” in the Massachusetts Bay Colony. Puritans in England soon surprised their American brethren by beheading the autocratic King Charles I in 1649 and by founding a republic under the iron-fisted Oliver Cromwell. Its ignominious fall in 1660 and the restoration of an openly Catholic monarchy for a time only deepened Puritans’ isolation in New England. Some of them intensified their mission there, becoming both more sanctimonious and more prosperous. 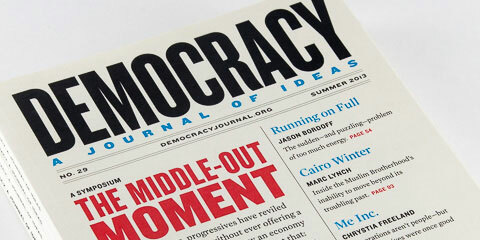 How they handled that deepening contradiction has marked the American republic and society. For example, in founding Harvard in 1636 and Yale in 1701, they gave rise to strains of intensive, elite leadership training that have continued right up through Franklin D. Roosevelt and, less felicitously, George W. Bush. Like us, Puritans faced a world increasingly connected but flattened by commerce. Unlike some of us, they believed very deeply in something better and stronger than markets. What, then, did they rely on? What were they about? First, in attempting to emulate the earliest Christian communities, they turned their backs on the golden thrones of popes and kings and countenanced neither aristocracy nor destitution—a revolutionary innovation in the early seventeenth century. Although they were often shrewd businessmen, they never argued openly that prosperity brings freedom and dignity, preaching instead that it carried communal obligations. Second, they weren’t out to “make history,” as we try to, through scientific planning or by discerning great movements of Hegelian Reason in our strivings, but by fulfilling the pre-established biblical typology of the Israelites’ exodus from Egypt on a sacred mission to a Promised Land. (Hence their naming some New England towns Salem, Goshen, Bethlehem, Sharon, and Lebanon; hence the Hebrew on the seals of Yale and Dartmouth.) What might seem a worldly enterprise financed by English entrepreneurs was, in the Puritan reality, a mission for “The General Restoration of Mankind from the Curse of the Fall” that would bring a blessing upon all the nations of the Earth. Imperfect keepers of their faith though the Puritans were, they held convictions by which they could be called to account in ways liberal bureaucratic nudging can’t replicate in a society that shares few convictions even when it faces enemies defiant of worldly power and death. Those new enemies are nihilistic, but when they behead liberal captives on video, they mirror back to us what has become abysmal in our putatively liberal democracy—from unspeakable horrors like Abu Ghraib, extraordinary renditions, and, as tellingly, school and police shootings on down to road rage, cage fighting, and nihilistic entertainments in certain video games and movies such as Zero Dark Thirty and worse. Puritan hellfire sermons and witch hunts—the latter few and far between in America, killing at most a few dozen people in a century—weren’t as widely, relentlessly destructive or terrifying as our media and our conduct now. All the more reason to know more about what our republic emerged from and abandoned, not because we can or should return to Puritanism—it certainly was repressive, though in some ways saner and more peaceful—but because, by understanding what it did right, we can see more clearly what we lack. Puritanism set up a creative tension between personal autonomy and communal obligation, impassioned conscience and sober humility, and vigorous enterprise and collective obligation, each side of these apparent antimonies spurring the other. Here I can only sketch how I think it worked and what we have lost because it failed. Before doing that, though, I want to consider why we resist feeling our way back into Puritan reckonings that seeded some distinctive, resilient strains in the American liberal capitalist republic. Then I’ll make a few more observations about what the Puritans’ example still offers us. These illuminations aren’t prescriptions. There are no “takeaways” for policy-makers, not least because Puritan wisdom scrambles the binaries hobbling so much of our politics. As Tawney put it in 1926, “There was in Puritanism an element which was conservative and traditionalist, and an element which was revolutionary; a collectivism which grasped at an iron discipline, and an individualism which spurned the savorless mess of human ordinances; a sober prudence which would garner the fruits of this world, and a divine recklessness which would make all things new.” Modern conflicts such as left and right disappear next to vertical ones such as heaven and hell. Understandings of personal “upward mobility” pale next to yearnings for a salvation that cannot be plotted or earned. One reason we resist Puritan reckonings is that we remember only that they were hypocritical and brutally—dare one say, Puritanically—repressive. Their presumptions about everyone’s innate depravity and everyone’s unknowable predestination for damnation or salvation, and the prurience and general nosiness that this prompted, stick like bones in our throats. But a second reason why we resist looking back is that the Puritans failed so candidly that they foretold with startling clarity how we’re failing now. Winthrop told Boston’s first settlers, still aboard the Arbella, that their “commonwealth” couldn’t coexist with unbridled individualism, no matter how sacred the individual soul. “It is a true rule,” he said, “that particular estates cannot subsist in the ruin of the public.” No other leader of a polity was saying this in 1630. When he said that “wee must be willing to abridge our selves of our superfluities, for the supply of others necessities . . . make others Condicions our owne . . . allwayes haveing before our eyes our Commission and Community in the worke,” he wasn’t propounding what we’d call socialism; he was plenty attentive to his own “particular estate.” But his conception of the proper balance between “particular estates” and “the public” anticipated a central conundrum for a liberal, contractual capitalism that has no covenant but a Constitution that’s not as strong as the swift, dark undertows that today’s capitalism has unleashed. A third reason why we avoid feeling our way back into Puritans’ premises and practices is that, in the 1870s, long after they’d lost their ecclesiastical and juridical grip, a new Gilded Age plutocracy revived a semblance of Puritan rigor and sanctimony in an effort to cover its own naked greed and toughen its children. This revival of Puritanism reached full force in the 1880s, with the establishment of strict boarding schools such as Groton (which FDR and, later, the diplomats Averell Harriman and Dean Acheson would attend) and of admonitory public exemplars such as Augustus Saint-Gaudens’s commanding bronze sculpture, “The Puritan,” displaying the firm countenance and assured tread of Samuel Chapin (1595-1675), a founder of Springfield, Massachusetts. Soon enough, though, economic panics and strikes and a failed crusade to make the world safe for democracy discredited the grand sham of Calvinist rectitude, Victorian gentility, and crony-capitalist bombast around John D. Rockefeller and J.P. Morgan with a deluge of debunking by H.L. Mencken, Randolph Bourne, Van Wyck Brooks, and James Truslow Adams, for whom “Puritanism stalked the country, a curse from the past, the original sin that left everyone guilty and repressed,” as the late historian John Patrick Diggins put it. Mencken famously defined Puritanism as “the haunting fear that someone, somewhere, may be happy,” and it never recovered. A fourth reason we resist looking into our Puritan origins is that at least half of even the earliest Massachusetts settlers weren’t Puritan congregants; some were adventurers of a different sort, others indentured servants, and, soon enough, even the land-starved second and third sons of the settlers drifted away. Since then, the vast majority of Americans have been carriers of traditions at odds with Puritanism even when they are Christian—as, increasingly often, they are not. Most immigrants have come here mainly to improve their material fortunes and their children’s prospects and to enjoy certain liberties, but not to take up the Puritan rigors of renewing those liberties that founders of the American republic such as John Adams and James Madison hoped we would take up when they wrote about what republican citizenship requires. But that doesn’t mean that we couldn’t reassume those rigors with the right institutions and instruction. In this, I argue that the Puritans can still offer some guidance. Consider the Puritans’ bequests, in several dimensions. Perhaps the most arresting is the example they set in picking themselves up and leaving everything they’d known and loved, as well as hated, to cross an ocean, under conditions we can barely imagine now, to “a howling wilderness” where appalling loneliness and collective hysteria would seize some of them at times. The strength they drew from their pilgrim faith and from one another is so difficult for most of us to fathom that we tend to imagine religious cults or fascist rallies; and indeed, Puritans were sometimes as perverse to one another and as brutal in massacring Native Americans as the Israelites had been at the foot of Mt. Sinai and in slaughtering the Amalekites without mercy. Not only does this echo Winthrop and the Plymouth Pilgrims’ Mayflower Compact, it also reminds us that a liberal capitalist republic must ultimately rely on citizens voluntarily upholding public virtues and beliefs—reasonableness, forbearance, a willingness to discover one’s self-interest in serving public interests—that neither the liberal state nor capitalist markets do much to nourish or enforce. The liberal state doesn’t do it because it’s not supposed to judge between one way of life and another (as Puritans certainly did). Markets don’t do it because they work by approaching individuals as self-interested consumers and investors, not as bearers of a common mission. Small-r republican citizens and leaders need to be cultivated all the more intensively somehow. For that we now rely on “civil society”—public schools, colleges, churches, civic associations, and youth sports leagues that stand somewhat apart from markets and the state. But with that model unwinding amid economic, technological, environmental, and other riptides that we ourselves have set in motion, we may need a new cosmology to address them in ways that a liberal capitalist republic no longer can. A look at the Puritans revivifies that unnerving insight. Their soul-tormenting, death-defying Calvinism ran on through the Abolitionist movement, Harriet Beecher Stowe’s novel Uncle Tom’s Cabin, and the reckonings of millions of Americans, including Abraham Lincoln, who called Americans the “almost chosen” people. The tricky, sometimes tortuous Puritan balancing of deeply personal affirmation and decidedly public action also ran through the mid-nineteenth-century Whig Party, which has been called “the ghost of Puritanism” because it married eighteenth-century republicanism with the spiritually preparationist Puritanism found in Methodism. It also revived a tough-minded strain of orthodoxy that, in somewhat secularized form, may still drive the Midwestern Methodist Hillary Rodham Clinton and the Oklahoma native Elizabeth Warren (who has transplanted herself, revealingly if not quite providentially, to represent the Commonwealth of Massachusetts in the U.S. Senate). When Warren reminds entrepreneurs that they couldn’t prosper without public transportation, security, and education, she’s reviving Winthrop’s “true rule” that private estates cannot subsist in the ruin of the public. Warren is also drawing on latter-day Puritan currents that ran through the Progressive Party, to which Theodore Roosevelt declared, in his impassioned run for another term as President in 1912, “We stand at Armageddon and battle for the Lord!” And Martin Luther King Jr. was a true Puritan dissenter in affirming the covenantal Exodus narrative; he was fatalistic about making history through any means besides moral witness, no matter how necessary the political strategies around it. The historian David Chappell shows in A Stone of Hope that King’s deeply Puritan understanding of original sin placed more faith in the timeless validity of the Exodus typology than in Hegelian or liberal history-making: “We Shall Overcome” was not a secular, political vow but an affirmation of divinely scripted destiny that would require struggle and perhaps defiance of death but would be won only with God. In a remarkable symbolic convergence, Yale president Kingman Brewster Jr., a direct descendant of the Elder William Brewster on the Mayflower and therefore of the Puritans’ instantiation of the Exodus, presented an honorary doctorate at the 1964 Yale commencement to King. Brewster understood King’s mission as some Yale alumni who thought him a lawbreaker did not, and at that high moment for the American civic religion, Brewster and King joined hands not only across a race line but also across time and space to affirm something about the country that still mystifies and astonishes much of the world: its conviction that religious commitment and civil liberty reinforce each other, and its expectation of faith, even without any imposition of doctrine. Not only do such affirmations rattle our liberal notions of place and historical time and progress; in Lincoln, Stowe, Roosevelt, and King, they unleashed prodigious energies precisely by channeling them. Heightened, sometimes tormented personal identities were developed in communities that tempered and channeled individuals’ inner journeys even while leaving their destiny ultimately to God. This fraught balance of autonomy and authority, based on a willingness to harness one’s lonely pilgrimage to the collective errand, has given to American civic culture a powerful and—as it appears to much of the rest of the world—inexplicable drive. The first American Puritan leaders were graduates of Cambridge University in England around the turn of the seventeenth century, meaning that they were religious but not medieval. They founded Harvard—“dreading to leave an illiterate ministry to the churches when our ministers shall lie in the dust,” as they put it—and Yale, to be even more orthodox than Harvard. With Winthrop’s admonitions about the dark side of economic development firmly in mind, these and other Puritan colleges (Dartmouth, Princeton) would strive, long after the Puritans were gone, to temper students’ preparation for wealth-making with training for republican power-wielding and for Calvinist, ancient classical, and even scientific truth-seeking (Puritans were enthusiastic astronomers and adherents of Newtonian physics). For much of American history, many graduates of these colleges and the preparatory schools that fed them took seriously their obligation to lead and, when necessary, to defy established power in the name of a higher power. In his first inaugural address, Franklin D. Roosevelt declared, “We must move as a trained and loyal army willing to sacrifice for the good of a common discipline,” and he summoned Americans to “old and precious moral values” and “stern performance of duty.” One of the most important influences on him had been his Groton School headmaster Endicott Peabody, a descendant of the Puritan John Endicott, who came to Massachusetts two years before John Winthrop to discipline a fishing colony at Salem. At Groton and similar New England college-preparatory schools, the very brooks seemed to bubble with moral instruction. Eight-man river rowing taught that self-denial for the common good requires first a self made strong enough to deny. What might seem like a row of automatons in a boat gliding down the river was actually a joining of eight different struggles against personal fears and infirmities into a common body and purpose. Some students carried this fortitude into their study of classics and history, learning early that participating in great, intergenerational efforts requires courage, prowess, and dedication to the mission. At their best, the schools encouraged self-scrutiny, plain living and high thinking, an understated felicity of expression, a quiet readiness to take responsibility without reward, and an ability to bear pain with grace (if only because spiritual grace was thereby assured). Averell Harriman, the Cold War ambassador to the Soviet Union, and Dean Acheson, the early Cold War secretary of state, rowed in those eight-man boats at Groton and wound up in Yale’s secret societies—Harriman in Skull and Bones, Acheson in Scroll and Key—whose members would later include Yale’s power-defying chaplain of the 1960s, William Sloane Coffin Jr., as well as Presidents 41 and 43. As attorney general, Harvard graduate Elliot Richardson would sacrifice his career for the republic during the Watergate “Saturday night massacre” by refusing to fire special prosecutor Archibald Cox, another Harvard graduate who was ultimately dismissed for investigating the complicity of Richard Nixon’s assistants. Jerome Karabel has shown amply in The Chosen: The Hidden History of Admission and Exclusion at Harvard, Yale, and Princeton that the term “character” is often abused as a shorthand for elite breeding, but in these and many less heralded cases it really meant something invaluable to legatees of the Puritans and framers of American republican leadership. “To a remarkable extent,” Kingman Brewster told Yale’s entering class in 1965, “this place has detected and rejected the very few who wear the colors of high purpose falsely. This has not been done by administrative edict or official regulation . . . [but] by a pervasive ethic of student and faculty loyalty and responsibility and mutual regard which lies deep in our origins and traditions.” Tempting though it is these days to dismiss that observation as a snob’s boast about an in-crowd, Brewster more likely was channeling the Puritan minister Richard Mather’s observation of 1657: “Imposters have but seldom got in and set up among us; and when they have done so, they have made a short blaze and gone out in a snuff.” Brewster really wanted Yale students to search themselves and history to know true leadership from false. That knowledge would determine how Americans lived, invested, and waged wars. Arguably, no American President after Lincoln and Theodore Roosevelt appreciated those high stakes better than Franklin D. Roosevelt, who learned to meet such challenges between 1896 and 1900 at Groton, not by river rowing but in football, which every boy was required to play. According to Endicott Peabody’s biographer, Frank Ashburn, the rector admired football “because it is a game that is rough and hard, requiring courage, endurance, and discipline. Instinctively he trusted a football player more than a non-football player, just as the boys did. He liked to win and hated to lose, but he would not stand for poor sportsmanship during or after a game.” Peabody also said good night personally to every boy, each night—they’d line up to shake hands before heading to bed—and every boy received birthday cards from him for the rest of his own and Peabody’s life. “If the alumni were good sportsmen, they were commended for it. If their behavior was rumored dubious, they were questioned about it” in a letter from the headmaster, even after they were well into college. Thus did a Puritan see his young charges through their stages of introspection and potential rebellion. As Peabody defended Roosevelt at the Union League Club, a still and perfect silence descended upon the room. His other Groton “boys” were struggling to reconcile their filiopietistic respect for the rector who’d said good night to them and taught them all to play hard and fair, with their loathing of his gallant friend, their fellow alumnus, a tribune of the downtrodden. A liberal capitalist republic hangs in the balance of silences like that. Puritanism had something to do with this one. Long before and for some years after Peabody’s death in 1944 (a year before his student Franklin’s in 1945), headmasters of the New England prep schools referred to one another as “the brethren,” bearers of the old Puritan mission into the wilderness. Their students had become plutocrats and sinners upon whose shoulders the mantle of Winthrop, Cotton, and Chapin rested uneasily, but, at times, they could be called to account by a power higher than their own. In Roosevelt and other framers of the American Century and the postwar Atlantic alliance, that made all the difference. To recall that Winthrop and his followers left everything they’d known for everything unknown, and founded a pedagogy that put later generations of public leaders through experiences almost as demanding, is to see that what they accomplished was as awe-inspiring as it was dark and conflicted—and not a little scary on the eve of our own neoliberal shipwreck. It’s easy enough to assail today’s conservative pretenders to Winthrop’s public rectitude or, for that matter, Edmund Burke’s. It’s much harder to assail liberals’ grievous lack of Puritan steel when they feign concern about oppression while groveling to enrich “particular estates . . . in the ruin of the public,” as Winthrop put it. Liberals’ feckless accommodations to powerful interests are, indeed, more reactive to intense pressures than they are causal. Even so, they amount to a complicity that would have appalled real Puritans, including dissenters such as Roger Williams and Anne Hutchinson. Liberals who are doing too well in the neoliberal dispensation to be serious about redressing its inequities make only moralistic, conscience-easing gestures in that direction. At the same time, they often legalize and fund relentless assaults on human dignity and safety by our vast incarceration system and by the perverse financing and marketing of economic plunder. No less than conservatives, liberals have lost their ability to sustain through public discipline the old balances of autonomy and obligation that Puritans wove into the fabric of the American republic. Rethinking our attitudes toward Puritans might help us to reassess the neoliberal synthesis of liberal relativism and omnivorous “free” marketeering that has formed a shroud that has enveloped us all and that is dissolving our political culture. Tearing holes in that shroud is going to take enormous courage and tenacity. Instead of congratulating ourselves for having debunked the faux-Puritan hypocrisies of Gilded Age plutocrats and bourgeois Victorians, let’s draw enough wisdom from Puritan wellsprings to chill our own applause for—and I would say, even our attraction to—the garden paths leading us up toward Dave Eggers’s dystopian Silicon Valley campuses and the glittering, Singaporean entrepôts whose heralds like Fareed Zakaria have convinced even Barack Obama that they’ve seen the future and that it works. Let’s try to remember America’s first Very Serious People more accurately and even kindly, as I’ve tried to do here. Do we follow John Winthrop’s admonition to “abridge ourselves of our superfluities for the supply of others’ necessities,” or do we disguise our accommodations to particular estates and the ruin of the public under rubrics of “growth” laced with moralistic gestures toward narrower forms of liberation? The latter won’t slow the ruin, not only of the public, but, now, of the planet; why keep on pretending that we are consummating history, as we thought we were doing when the Iron Curtain collapsed? Why not give up the secular eschatology with which the old left misled much of liberalism itself? Why not rethink the codependency of Americans’ private curses and public dilemmas upon which the United States now runs? Writing in the 1950s in his book Seedtime of the Republic, the American historian Clinton Rossiter, himself a descendant of New England Puritans, offered a civic-republican update of Winthrop’s warning: “To men and nations who obey this law come prosperity and happiness; to men and nations who defy it come adversity and sadness. History has a way of punishing those who deny the reality of moral restraints on political power.” By “this law,” Rossiter meant what Peabody, Brewster, Coffin, Richardson, and other legatees of the Puritans meant: the will to sustain both communal solidarity and love of liberty against tremendous odds through tough-minded extensions of trust that beget trust and a faith in things unseen. When the religion of a people is destroyed, doubt gets hold of the higher powers of the intellect and half paralyzes all the others. Every man accustoms himself to have only confused and changing notions on the subjects most interesting to his fellow creatures and himself. His opinions are ill-defended and easily abandoned; and, in despair of ever solving by himself the hard problems respecting the destiny of man, he ignobly submits to think no more about them. Such a condition cannot but enervate the soul, relax the springs of the will, and prepare a people for servitude. Not only does it happen, in such a case, that they allow their freedom to be taken from them; they frequently surrender it themselves . . . As everything is at sea in the sphere of the mind, they determine at least that the mechanism of society shall be firm and fixed; and as they cannot resume their ancient belief, they assume a master. That grim prospect left Tocqueville “inclined to think that if faith be wanting in [the individual citizen], he must be [a] subject; and if he [would] be free, he must believe.” Since the tyranny of the majority in a democracy has a legitimacy that’s hard to dismiss, it could be as suffocating as established religious authority. Now if the Lord shall please to heare us, and bring us in peace to the place we desire, then hath hee ratified this covenant and sealed our Commission . . . but if wee shall neglect the observation of these articles . . . and, dissembling with our God, shall fall to embrace this present world and prosecute our carnall intentions, seeking greate things for ourselves and our posterity, the Lord will surely breake out in wrathe against us. . . . Now the onely way to avoyde this shipwracke . . . is to followe the Counsell of Micah, to doe Justly, to love mercy, to walke humbly with our God. . . . Soe shall wee keepe the unitie of the spirit in the bond of peace. . . . Wee shall finde that . . . tenn of us shall be able to resist a thousand of our enemies. The wise American republican response to Winthrop’s impossible demand has been to expect faith, but without imposing doctrine, leaving room for unbelievers and atheists in the interstices. But I think that we can sustain that solution only if we’re haunted a little by Winthrop’s warning, as Americans from the Elder William Brewster to Kingman Brewster Jr. and from Roger Williams to William Sloane Coffin Jr. and Martin Luther King Jr. have been. That we’re no longer haunted may be as big a problem as the technological, epistemological, and climatic horrors we’re generating. Puritans generated them, too, but at least they had a language capable of calling themselves to account. We have apps and algorithms that they couldn’t have dreamed of. But do we have their wisdom and will? I grew up with remnants and echoes of Puritan civic culture in the western Massachusetts of the 1950s, and my interest has remained un-scholarly, and my suggestions for further reading are literary and political. No one has written “Puritanism for Liberals” for us now, but for a darker reckoning than mine with Puritanism’s lengthening shadow on our republic, look forward to Chris Lehmann’s forthcoming The Money Cult, some of which I’ve read in draft. For an engaging if challenging explication of how they really organized and understood their American settlement, with consequences we still live with, try John H. Schaar’s “Liberty/Authority/Community in the Political Thought of John Winthrop” in the journal Political Theory, Nov. 1991. R.H. Tawney’s literary “Puritanism and Capitalism,” The New Republic, May 12, 1926, is quoted in my essay, as are Mark Noll’s America’s God, (Oxford, 2002), a rich scholarly account of American Calvinism’s gestation of republicanism, and George McKenna’s The Puritan Origins of American Patriotism (Yale, 2007) a lively, more conservative reckoning. Jon Butler’s account of Puritan piety in Awash in a Sea of Faith is refreshingly counterintuitive, and Sacvan Bercovitch’s American Jeremiad is ravishingly poetic. To immerse yourself in Puritans’ terrifyingly intimate encounters with Indian and Jesuit civilizations on the New England frontier, read John Demos’ Bancroft Prize-winning The Unredeemed Captive. I’ve always relied as well on Edmund Morgan’s many books and—closer to my New England, civic-republican heart—Clinton Rossiter’s Seedtime of the Republic. In Liberal Racism I describe how that civic republicanism and its Puritan origins shaped W.E.B. DuBois in Great Barrington, Massachusetts shortly after the Civil War.